Home » Meat Recipes » Scottish Eggs – what could beat boiled eggs deep fried when coated with sausage. Scottish Eggs – what could beat boiled eggs deep fried when coated with sausage. Scottish eggs are normally a treat I have had at fairs and other outings. Scottish eggs will set you back several bucks to buy one of these. These are hard boiled gets that are coated with sausage that has been seasoned, and then scottish eggs are deep fried. While not good for the heart, Scottish eggs are tasty and should be enjoyed in moderation. Enjoy this recipe, you can make Scottish Eggs at home, we will show you how. 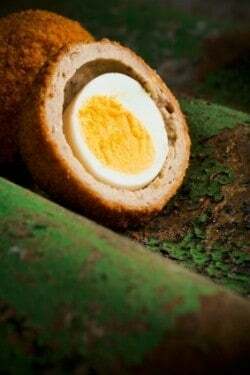 What could be better than a hard-boiled egg wrapped in sausage and deep fried? Coat each hard-cooked egg with flour. Divide the sausage into 8 equal parts. Make a patty out of each bit of sausage, and use it to coat each egg completely. Mix the breadcrumbs, sage, and salt. Dip the sausage-coated eggs into the beaten eggs; roll in breadcrumb mixture. Heat the oil to 375, for deep-frying. Deep-fry the eggs, for at a time, for 7 minutes minimum. Drain. Serve hot or cold. I’ve made these, but I bake them instead of deep frying. Not to say that mine are heart healthy, but they are a little bit less unhealthy. Baking seems to work fine. I use Jimmy Dean spicy sausage and coat with seasoned bread crumbs. How long and at what temperature do you bake?